In the U.S. there was Henry George; in Russia there was Leo Tolstoy; and in the Land of Oz there was Max Hirsch, the intellectual giant who made Australia his home while he battled for the restoration of humanity’s equal rights to the fruits of the Earth. Max was born in Cologne, Prussia, to a father who was a member of the Reichstag. Max’s idealism owes much to the influence of his father, who was a brave, outspoken writer on economic subjects and who came into conflict with the autocratic Prussian-dominated German authorities on account of his democratic principles. Max was educated at a high school and then started work at the university of Berlin, but at 19 years of age began a career of a further 19 years as an adventurous, global, commercial traveller – another example of a maverick economist who was better educated in the University of Life than in some tradition-bound educational institution. He was first sent to Persia to buy carpets and obtained many fine old specimens which he brought to London by way of Russia. With an insatiable appetite to question and explore, he then studied art in Italy before hitting the road again as a representative of British linen manufacturers. He first tasted Australia in 1879 (the year of publication of Henry George’s Progress and Poverty) before venturing on to Ceylon and engaging in coffee planting as well as being a member of the civil service. There he found that the rice tax was driving native cultivators off the land; this so aroused his sympathies that he wrote several pamphlets on the question, which led to the removal of the tax. In 1890 Hirsch settled in Melbourne (when George made his barnstorming visit here), and two years later basically gave up business to devote himself to fighting the good fight. Many of his numerous publications are available in our Hardware Lane library, with Democracy Versus Socialism being Hirsch’s master work. Published in 1901, it was the first book to deal comprehensively with Marx’s Das Kapital, and is arguably the most thorough refutation of the basic ideas of Marx ever written. While Ludwig von Mises is often praised as being the first economist to offer such a refutation, it is important to note that, with respect to the pitfalls of socialism, von Mises reached no conclusion in any of his works that Hirsch had not already reached decades earlier. 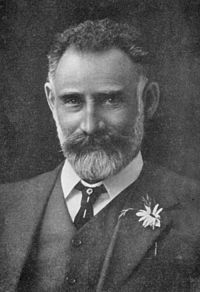 In 1902 Hirsch was elected to the legislative assembly for Mandurang. He resigned this seat in November 1903 to contest the Wimmera (rural Victoria) constituency in the federal house of representatives but lost by a lousy 160 votes. He had become the recognised leader of the geoist movement here, and his exceptional debating skills and compelling writing style brought him many followers. He was aided by an acute sense of logic as well as great care with his facts. He was no revolutionist, and stated on one occasion that if he were appointed dictator he would bring in land value taxation gradually. In his fight for free and fair trade, then a live question in Australia, he met with much hostility from vested interests, and his opponents did not forget to remind the public that he was German and a Jew. In 1906 he again failed to win the election for Wimmera. In October 1908 he left Melbourne on a business mission to Siberia but tragically died in Vladivostock after a short illness on 4 March 1909. Hirsch was, it seems, one of those men of virtue who seem to belong to a bygone age, renouncing the riches which his business expertise would so easily have brought in favour of battling for our great and noble cause.